During the last three weeks, I have attended two different conferences – both focused entirely on (Social) Networks: First, I went to Greece to attend the International Conference for Social Network Analysts (main audience/attendance: social scientists) and I am currently blogging from the NetScience conference in New York in the Hall of Science (main audience: scientists). Researchers in all fields, natural and social sciences are working on (social) networks and within their specific fields they are located in a very specific niche within their own discipline. This is reflected for example in the fact, that a lot of researchers feel obligated to explain what a social network is and what the definition of concepts such as centrality are. The basic concepts and analysis methods are the same across all disciplines, but we all use different language to describe what we are doing. Researchers in different fields have different needs for analyzing and visualizing their network data and those who have the abilities to do so are creating/programming their own visualization and analysis tools or libraries. This seems to be an exploding area and I see a potential to synchronize the different needs and tools across disciplines. 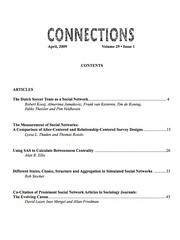 Academic disciplines on (social) network research are largely disconnected and innovation is occurring within the disciplines, but usually not across disciplines. It seems as if the wheel is reinvented, but because academic disciplines are isolated and siloed the overall network science field is extremely innovative for its specific audiences. The next annual conference of INSNA (International Network of Social Network Analysis) will be held in Corfu, Greece, in May 2007. Submission deadline is January 30, 2007. You can find the website here.